One of my great-grandfathers came from a family so poor that his parents abandoned him in Trafalgar Square. He somehow ended up in the hands of the Canadian Pacific Railway, was sent from London to Canada as an indentured child – a virtual slave – and began his new life as one of those little boys running messages up and down the transcontinental trains. He ended up driving the trains – chief engineers, I believe they were called. His son became a doctor in Winnipeg, then ran the St. Boniface Hospital. His daughter married a businessman, Merle Saul, my grandfather – and perhaps more successful as a hockey player. He played rover, a position for the fastest, most agile. His grandfather had immigrated to Montreal in the 1840s to work on the great Victoria Bridge. He was an illiterate stonemason and ended up in Camden East, west of Kingston, Ont., with a 100-acre land grant. More important, he became a very successful builder. His youngest son married the descendant of United Empire Loyalists – that is, a family of refugees who’d arrived from the United States in the 1780s having lost everything. They seem to have built solid, if unremarkable, lives in and around the neighbouring town of Napanee. In any case, that youngest son and his new wife moved out to Winnipeg in the 1890s, and did well – Saul and Irish, builders of large stone buildings. His grandson, my father, left university in 1940 to volunteer for the Winnipeg Rifles and found himself landing in the first wave on D-Day. He had already married a girl he fell in love with in England while waiting to be sent to fight – a war bride. 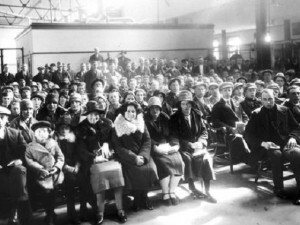 Forty-eight thousand of them came to Canada as young wives, bringing 21,000 Canadian babies and small children with them. Immigrants. I call them the refugees of love. They had left family and country to follow their husbands to a land they didn’t know. As for me, I married a refugee who arrived here as a small child. They had lost everything, and she did pretty well. All of these are immigrant stories; a surprising number are refugee stories. All people making their way. Contributing. Some are ordinary stories. Some extraordinary. The small abandoned boy in Trafalgar Square. The young woman following a man to a country she knew only through him. The young man running up the beach of Normandy on the cusp of history. The little refugee girl becoming governor-general. So, when I hear people debating the economics of immigration and refugees, I am always surprised. Speaking for my own family, trickling in here over two and a half centuries, we all arrived with nothing, except my mother who arrived with a little boy, my older brother. So, yes, some of us arrived with families, the core of Canada’s success. And we brought our ambitions, our skills, our talents, our hopes. And we made our way. Our stories have key shared elements. We were all products of the public school system, all people without privilege, and the Canadian system gave support to each to help with the transition. It seems to me that, from the immigrant point of view, Canada has been built in good part by people who arrived in need, received some form of support, and reinvented themselves. For several centuries much of that support came from Indigenous peoples, who were, in effect, the government of what is now called Canada. I thought about these stories when Adrienne Clarkson and I were at a Toronto airport terminal, greeting government-sponsored Syrian refugees as they left their plane. Most of the adults were farmers or mechanics or drivers or bakers, or had had other jobs requiring skills, but not a lot of education. There were some teachers. Not many. Twenty-seven thousand Syrians so far; by this year’s end, perhaps 50,000. This is the tradition of Canadian refugee policy at its best. Somewhere between 30,000 and 70,000 at a time: the Vietnamese boat people in 1979-80, the Czechs in 1968, the Hungarians in 1956, the Vietnam War non-consenting Americans, Chileans, Ismailis, Tamils. That refugee tradition goes back to the almost 50,000 United Empire Loyalists in the 18th century. With Syria, Canada made a very specific choice – to take families in exile in Jordan, Lebanon and Turkey. Because of the terrible rates of refugee drownings in the Mediterranean, we often forget that those with some money and often more education have tended to take the European route. It requires resources to make your way through the military and political blockages, through the human smugglers; even if the reality is highly dangerous. By taking families, we have reached out to the young, who have been unable to go to school for years. This is the exact opposite of the now-defunct Immigrant Investor Program and the suspended Immigrant Investor Venture Capital Pilot Program which, stripped of rhetoric, were about selling citizenship. They were devoid of the ethical core that goes with citizenship. And immigration to Canada is meant to be about just that. Citizenship. If we are honest with ourselves, we know that immigration and citizenship have never been, at their core, linked to money. Some come with finances – but most have little or none. And we have had a growing number of highly educated immigrants. But what makes our system work, including its economics, is the ethical idea that immigration is inextricably bound to citizenship and therefore to belonging. That idea of belonging is not tied to conformity – to the idea that we must melt into a mold which will make us all the same. If anything, it is our comfort with difference that produces economic drive, just as it has fed scientific innovation. And a cultural flowering – almost a third of those to win the Giller Prize for fiction have been foreign born. More than a third of some 18,000 Canada Research Chairs at universities across the country are foreign born. These are not utilitarian outcomes. They are attached to the complex Canadian idea of belonging, which brings these pieces together. Let me go back to the economy. The numbers are startlingly clear. After four to seven years here, the likelihood a new Canadian will own a business overtakes that of someone Canadian born. These may be smaller companies, but as Statistics Canada points out, after a generation, corporations are calculated in the Canadian-born category. And so we miss something special. As co-chair of the Institute for Canadian Citizenship, I follow this closely. My own sense is that the way we do our numbers is causing us to miss a revolutionary phenomenon – the rebirth of an economy of multigenerational, private, family-owned corporations. And these are largely the creation of new Canadians. In the lead up to the 6 Degrees Citizen Space gathering in Toronto in September, we are studying this phenomenon in partnership with the Centre for International Governance Innovation and The VanCity Group. The astonishing thing is that studies everywhere in the West – by the Organization for Economic Co-operation and Development, the European Union, by American universities – all demonstrate the positive economic force of immigration, whether it be its effect on growth, innovation or wealth creation. They all show that, financially, immigrants contribute more to social services than they receive. But there is an equally clear negative factor. The more this positive reality is treated as a utilitarian outcome separated from culture and from how diversity works, the more those who see themselves as custodians of the country’s past become frightened and convinced that money is flowing out; that immigration is an economic negative. This utilitarian error lays at the heart of Brexit, but also that of the rising fear, populism and racism in the United States and continental Europe. This utilitarian approach has been the EU’s biggest mistake. But utilitarianism has also had effects in Canada beyond the Immigrant Investor Program, as well as beyond the rampant misuse over the last decade of the Temporary Foreign Workers Program. Certain corporate sectoral lobbies want cheap labour unattached to social responsibility. They have pushed Canada to adopt policies inspired by the failed and socially disastrous European guest-worker policies. There was a bit of an ethical pushback near the end of the Stephen Harper era. And it is true that very limited parts of the foreign workers program are useful to precise sectors and workers, if strictly and justly administered. But the main contradiction remains – at its core, the policy denies the essential ethical link between immigration and citizenship. And it highlights a risk: that we may be on the edge forgetting that immigration to Canada has mainly been based on strong public and citizen support, to ensure a fast start for newcomers. This idea goes back to the sustained welcome given by Indigenous peoples, the New France support for immigrants and the Canadian colonial support for the Loyalists. Over the centuries this support was often a mix of government investment and citizen adoption of earlier arrivals by their own community. The decision to welcome the Syrians reminds us of that long history of public and citizen support. Why would we forget what works? Because utilitarian economics attacks as wasteful costs what we used to see as public investments in the country’s future. Utilitarianism takes us back to attitudes that produced the exploitation of Chinese railway workers, which in turn led to the head tax. Yet all of us, all our families, benefited from the reality of public investment in immigration and citizenship. What would this mean today? What are we not doing, or not doing enough? First, we seem to forget that our society and our economy were built from 1850 on the wealth of public education. Today that simple strategy is more important than ever. In an urban society, newcomers need to adjust much faster. Immigration often comes with language difficulties and cultural complexities. Both require much smaller classes for students. A monolithic group of middle-class children can get by in classes of 30 students. A complex school with many newcomers needs classes of 20 at the most and a greater emphasis on all those adjustment phenomena. That means more teachers. Many more. And volunteer mentoring programs like Pathways to Education have a strategic role to play. Canada is a world leader in volunteerism, but these kids, whose parents are themselves struggling with language and adjustment, need the support of established citizens. This is about much more than simple tutoring. And while it is true that new Canadians are above-average creators of companies and some of our large corporations have serious diversity programs, other companies as well as our schools, colleges, universities and governments are lagging behind in support programs. There are not nearly enough courses available on how our bureaucracies work, on regulatory structures, on business law, on the culture of business in Canada. There seems to be little understanding in the big urban centres that new Canadian entrepreneurs often prefer to install themselves in suburbs or smaller cities. This requires a different approach to training programs. As I looked through the many studies which have been done, the message keeps coming back to the lack of professional networks. I was left with the sense that basic things are not being done – or not done enough. Have chambers of commerce thrown themselves into helping new Canadians find their way? Are business schools – so obsessed with overcharging for their services – reaching out to help new Canadians get started? Who is providing easily available advice on professional norms, on how people act in business situations? Treat each other? In a very good Maytree and Metcalf Foundation report, we learn of initiatives being taken in the Netherlands and in Finland. In a Conference Board of Canada report, it is clear that businesses still do not take advantage of the language skills of new Canadians when it comes to international possibilities. And despite enormous pressure to change over the years, professional self-regulating bodies continue to grumble and to obstruct when it comes to the equivalence of foreign qualifications. This can be seen as a way to protect their advantages. By limiting membership in their profession, they limit competition. This is classic protectionism. Those old self-regulation models of the professions are increasingly an obstacle to maximizing the contributions of new Canadians. Germany – the champion of tough professional standards! – is now moving ahead of Canada by setting up clear, efficient equivalency rules for immigrating professionals. In spite of all these problems, immigrants and new citizens continue to be important drivers of our economy. And they quickly become participants in society, and catch on to the volunteerism ethic. But Canada has never been a place of economic ease or easily shared well-being. If it works, it is because we have designed social agreements and public policies to support individual action. It is fashionable to insist that everything changes. And some things do change. But social behaviour and its economic outcomes are pretty stable factors in all societies. The Canadian idea that an immigrant is a citizen in the making is tied to the idea of both public support and volunteerism. And all of this makes it possible and essential that we will adjust and act aggressively to ensure that new citizens get their chance. At this point, I would say that they are making their effort, while our constituted society is lagging behind. John Ralston Saul is the author of The Collapse of Globalism (2005), which predicted much of today’s international economic strife, as well as the return of aggressive nationalism and populism. He is president emeritus of PEN International and co-chair of the Institute for Canadian Citizenship. Photo credit: Canadian Museum of Immigration at Pier 21. Dutch arrivals in the 1920s.